My girls can not seem to keep their little hand towel hung up on the ring next to their sink. I constantly find it on the counter or the floor. At least I know they are actually washing their hands! This easy project is a perfect way to keep those hand towels hung up and it's pretty cute too! You will need a washcloth and a wide ribbon about 30 inches long. Line up the middle of the ribbon withe the center of the washcloth, right sides together. This means the printed side of the ribbon should be facing down. Now sew a seam across the width of the ribbon, attaching it to the middle of the washcloth. Sew over this seam a few times to make sure it will be strong enough to handle some pulling. 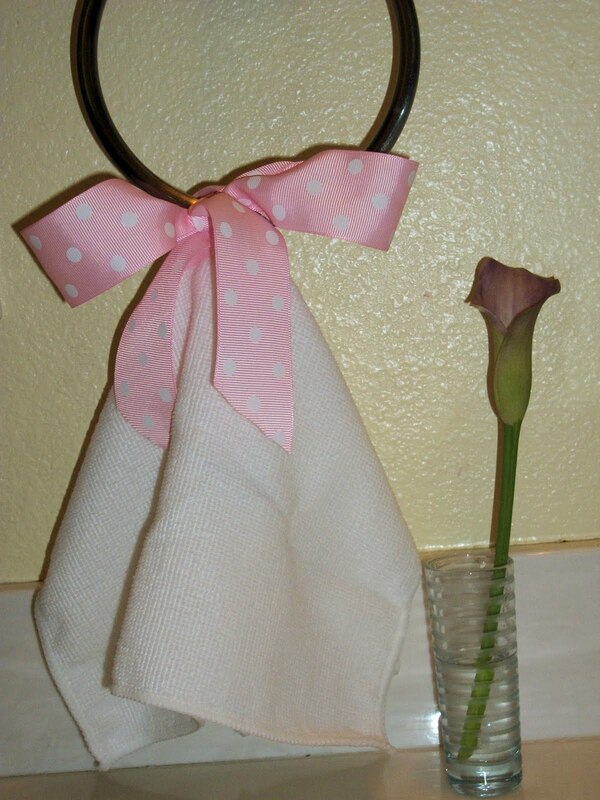 Tie the ribbon around your ring or towel bar and you are ready to dry your hands. This is so easy to change up to match any bathroom just by choosing your washcloth and matching ribbon. Precious! And what a cute way to make a plain white washcloth / towel coordinate with any bathroom color.